The Ocean Drive Marathon in Cape May, NJ was a great race even though the weather was Brisk and damp, being just off the water. In case you don’t know where Cap May is in New Jersey, it is at the southernmost tip. This is where the Delaware Bay splits New Jersey and Delaware and opens up into the Atlantic Ocean. As you know, Hurricane Sandy caused quite a ruckus in New Jersey, but luckily things are starting to get back together thanks to the diligent efforts of the people who live there. 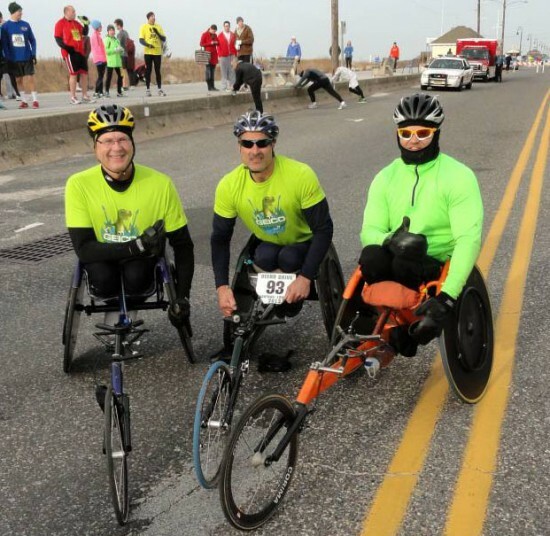 The Ocean Drive Marathon was a good example of this diligence, the race director in particular made sure that transportation was available for wheelers as well as non-wheelers to the starting line and from the finish line back to the start. 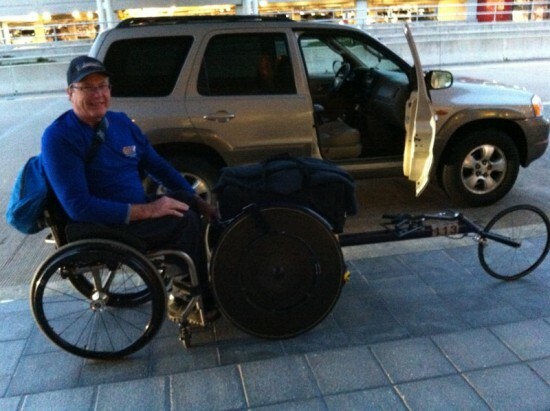 Not to mention that some of us wheelers needed our everyday wheelchairs delivered to us at the finish line. The course itself was well laid out and marked. Well, with one exception, somehow Grant got detoured off the main course at about the 12 mile marker, but got back on track about a half mile later. The last half mile or so of the race was along the ocean front. We could hear the waves crashing onto the beach as we came closer to the finish line. It made for an exhilarating end of the race. 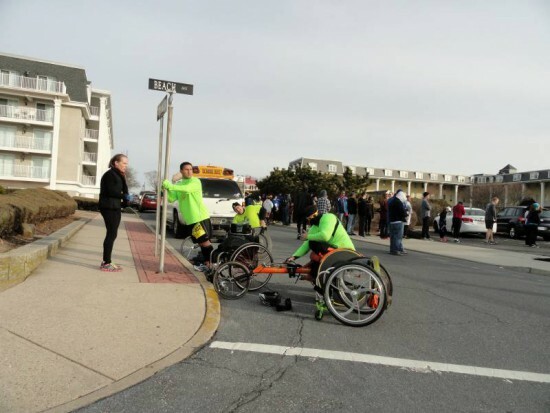 Paul’s brother Mike was a big help for the Cape May New Jersey Marathon. 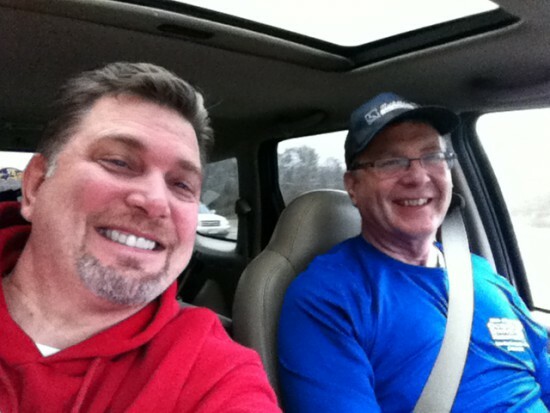 Mike lives in the area and was able to pickup and dropoff Paul at the airport. Not to mention loan him his car for the weekend. Rental Car Companies are great, but Family is even better. Kudos Mike! Here is Paul getting ready to jump on a Southwest Flight back to the Louisville, KY Airport. Just like Santa Claus, once you realize that he has been to your town, he is already on his way to the next town. All he leaves behind are tire tracks. Aaron and Paul getting into their Racing Chariots and preparing for a Chilly start to the race. The 50 Ability Marathons Team just before the start of the race. Looks like a “Brisk” Morning just off the beach. Solo picture of Grant at the Finish Line in Sea Isle City of the Ocean Drive Marathon catching his breath for a moment while waiting for his teammates Paul and Aaron to cross. “I like this bus, the driver accepts Bananas as payment. 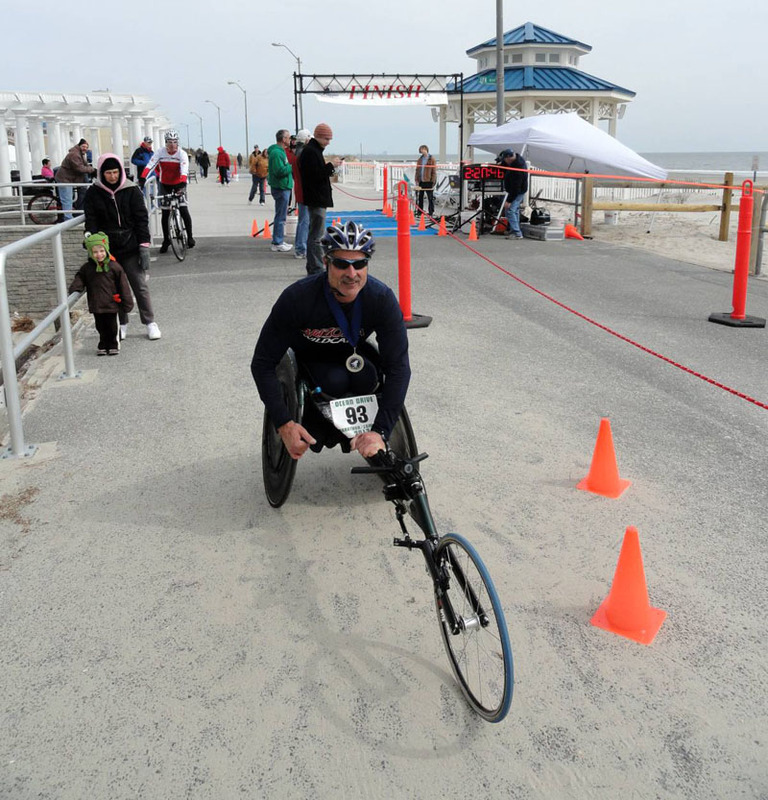 675 runners, 3 wheelers and 1 handcyclist.